Leading an OSO session? Read this! You like playing music with others? If you are able to get at least some sounds out of your instrument, this might be the project for you. 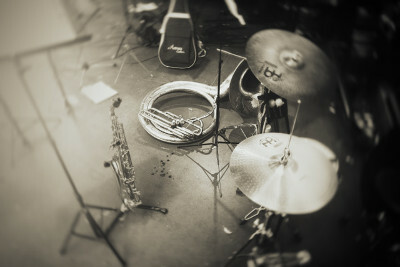 We will play traditional jazz/swing tunes, the only requirement is having fun playing music together with other people. 04.05.2019 4pm Michaela K. Leader's choice! 18.05.2019 4pm email tobi@oso-berlin.de if you want to lead this session! Leader's choice! 01.06.2019 5pm LIVE SHOW at Wilde13 Street Festival Florakiez, Berlin-Pankow - everybody welcome! 09.06.2019 9pm LIVE SHOW at Alte Turnhalle, Holteistr. 6-9, 10245 Berlin - everybody welcome! 15.06.2019 4pm email tobi@oso-berlin.de if you want to lead this session! The sessions are mainly focused on people who like swing music (especially but not necessarily swing dancers) and who are not yet so confident with playing their instrument to participate in "real" jam sessions. We will move ahead very slowly and with much patience. We have comprehensive chord lead sheets and mostly also complete sheet music of the songs we are playing. It is possible to download the sheets beforehand right here. In fact it is highly recommended to print out the sheets for your instrument and bring them with you to the sessions since it's not always possible to have all the paperwork available. It's not strictly necessary to be able to read music, though. We will play easy songs in an easy way. Bring your instruments and let's have a good time!